I can often find a link between someone from Sevenoaks and one of the significant anniversaries of the First World War and the sinking of the RMS Lusitania on 7 May 1915 is no different. 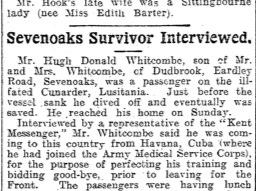 A local man, Hugh Donald Whitcombe, whose parents lived at Dudbrook on Eardley Road was on board the ship. Fortunately, Hugh survived that terrible event and lived to tell the tale, his story being recorded in both the Sevenoaks Chronicle and the Kent Messenger. Hugh Martin Donald Gore Whitcombe, was born in 1894 in Suffolk, the son of John Walker Whitcombe and his wife, Katherine Louisa nee Linnall. By 1901, the family are living in Sevenoaks and the 1911 census records Hugh as an engineer at a motor car works in Coventry. He left for the USA and then Cuba in February 1912, sailing on the Lusitania where his occupation was recorded as chauffeur. Three years later in 1915, Hugh was sailing from Havana, Cuba, where he had joined the Army Service Medical Corps. According to his interview with the Kent Messenger, the passengers were having lunch in the dining saloon about four flights below deck when he heard a big bang “and the plates and everything on the tables were upset, and fell into their laps”. He stated that everyone knew at once what had happened but took things calmly, the males keeping their seats, until the ladies and children were got up to the boat deck. “Some ladies fainted but the babies, not understanding what happened, remained happy”. Hugh then made his way to the boat deck and helped get women and children into the boats. The ship had listed heavily to starboard the moment she was struck and the rescue rafts on the port side could not be used as the vessel had listed, bringing that side high out of the water. According to Hugh’s account, the sinking was so rapid that the other boats were only just away before the ship went down, while many boats “were struck by the funnels and were taken down by the boat itself”, with only twelve of the original nineteen boats getting away. “The water was full of struggling men and women. We managed to drag onto our raft a lady whose hand and leg had been badly crushed, and a little later a lady who was holding a dead child. We then manoeuvred our raft to an upturned boat and clambered on to it and remained drifting about until we were picked up by a destroyer, It was a horrible time – terrible! The elderly gentleman became exhausted and died before we were picked up, and we had to take the dead child from its mother, as the poor woman was growing frantic”. After three hours in the water, they were picked up by the first destroyer from Queenstown and taken to the town. “It was”, Hugh told the press, “a terrible sight to see wives looking for their husbands, husbands for their wives and children for their parents”. Hugh had been travelling with five pounds worth of tobacco and cigarettes, sent by Cuban planters for the Indian soldiers – all of this and his own possessions were lost. Arriving safely in Sevenoaks, he said that despite some stiffness and bruises and a cut from a wire across the leg, he was little the worse for his experience. Hugh went on to serve with the Army Service Corps and later with the Royal Flying Corps, being awarded the Belgian Croix de Guerre. Sadly, he died of sunstroke on 23 July 1920, and was buried in the Mikra British Cemetery in Kalamria, Greece. 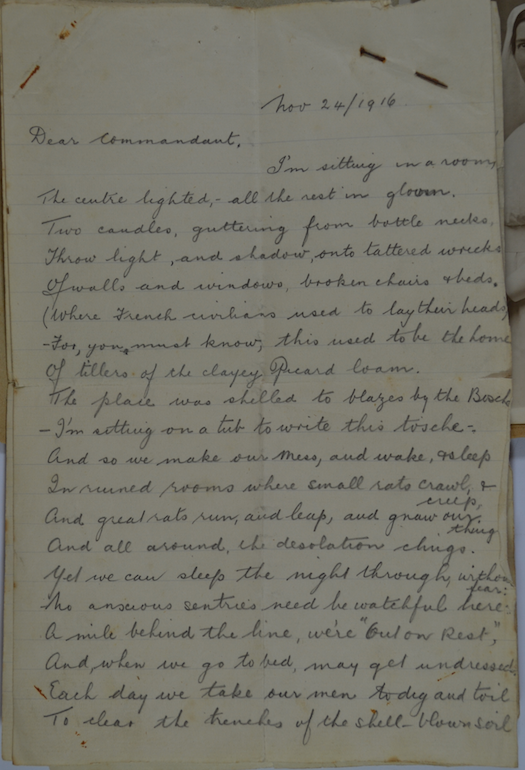 Amongst the archive material from one of our local VAD hospitals, Cornwall Hall, is a carefully preserved three page letter, written entirely in verse and signed Eric F Wilkinson. Wilkinson is also the subject of a newspaper article on the following page of the scrapbook. 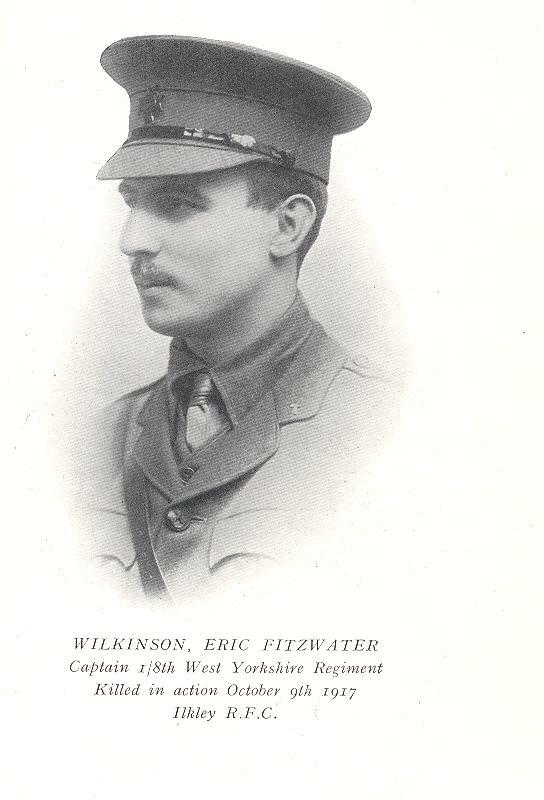 He was Captain Eric Fitzwalter Wilkinson who served with A Company of 8th Battalion West Yorkshire Regiment (Leeds Rifles). Wilkinson was born in 1891 and was educated at Dorchester and then Ilkley Grammar School. He took an engineering course at Leeds University and later became a Master at Ilkley Grammar School. Before the war he wrote poetry for the school magazine and he continued to write during his time in the army, which he joined in 1915. Some of his poetry was published and well received during the war. While serving as a Lieutenant with the Leeds Rifles, he won the Military Cross in July 1915, according to the citation, ‘Near St Julien, he assisted to carry a wounded soldier for a distance of 120 yards into cover under circumstances of great difficulty and danger’; he was also twice mentioned in despatches. He was wounded in winter 1915, by a bayonet attack and was also later gassed. He was injured in July 1916 and appears to have spent some time in hospital at Chatham before arriving at Cornwall Hall, VAD 76, in Sevenoaks. Later that year, Wilkinson wrote his letter on 24 November 1916, to Kathleen Mansfield, the Commandant at Cornwall Hall, whom I mentioned, along with nursing Sister, Emma Crump, in an earlier post. The candle lighted, – all the rest in gloom. Of tillers of the clayey Picard loam. – I’m sitting on a tub to write this tosche-. And all around, the desolation clings. To write and tell the gratitude I bore. And Sister Crump, and Flo, and all I knew. ‘That Be’, and carry on the same old way. Yours gratefully – Eric F Wilkinson. He was my sister’s son. When war broke out, he was a master in a Wharfedale grammar-school but a Boy all the same, though twenty-three years old. By virtue of peacetime-training with the O.T.C. he got an immediate commission in the West Yorkshire Regiment (Leeds Rifles) and went to France early in 1915. All through the winter of 1915-16 he was in the nameable trenches in front of Ypres, nothing more serious befalling him than a bayonet wound and a partial asphyxiation by poison-gas. His part in the great battle of July 1 1916 was the abortive attack on the stronghold of Thiepval. ‘During the night’ he wrote to me ‘I went up to support some men of another division in a trench we had taken and found it had been recaptured. I went in with twelve men and said ‘Hullo!’ to the first person I met, who promptly lobbed a bomb at me. Greatly scandalised, I said ‘English, you thundering fool!’ whereas he and divers unruly other companions did pelt us with bombs. Five of us got away, three wounded’. The horrid wound that fell to his share brought him back to Blighty. Writing from a hospital at Chatham he said ‘So far, we have abstracted one piece of bomb-casing and half a tunic but we suspect the presence of a pair of trousers as I came back the night it happened practically without, and they seem to have gone somewhere’. ‘The Bosche have been trying a new gas on us and I don’t think much of it’. But he was blind for three days and his sight permanently modified. I had thought that would be the end of this particular story. However, in researching Captain Wilkinson’s war service, I discovered his participation in one of the war’s significant events, the mutiny at Etaples. Etaples was a training camp for veterans of the frontline, providing refresher training. Criticism was often made of the harsh regime at the infamous ‘Bullring’ and of the staff and officers and their alleged lack of experience at the Front. On the afternoon of the 11th instant, I was in charge of a Picquet of 150 armed and 50 unarmed men on the Bridge over the River Canche leading from Etaples to Paris- Plage. At about 9.15 pm about 80 men marched towards the Bridge from Etaples, some of them armed with sticks and notice boards. The Picquet failed to stop these men from crossing the Bridge. The accused detached himself from this party and while I was addressing my Picquet and remonstrating with them for failing to stand-fast. The accused started haranguing them. Referring to me he said “you want to put a rope round that buggar’s neck tie a stone to it and throw him into the River”, and he told the men that they should not listen to me. Within a few minutes I was able to get the accused arrested. Jesse Short was tried and sentenced to death, which was confirmed by Sir Douglas Haig on 30th September, the execution being carried out on 4th October 1917. Wilkinson’s war record and his poetry shows how far he was from being the caricature of an officer seeking an easy life well behind the lines or an unrelenting disciplinarian and it would be interesting to know what he thought of the incident. He died only four days after Corporal Short’s execution, on 9th October, suggesting that he had been swiftly moved on from Etaples. According to reports ‘Amid the sea of mud he became separated from his men and was last seen making single-handed for the enemy lines’. He is buried at the Tyne Cot cemetery. I’ll be making a trip to the National Archives to see if Wilkinson’s service papers offer any more information about his army career, including the incident at Etaples and the aftermath. If any readers know anything I’d be very pleased to hear from you.